First discovered in 1968, Tanzanite is one of our newest and most exotically colored gemstones. While many gemstones are found throughout the world, Tanzanite is mined in only one corner of the earth...Tanzania, Africa, its namesake. Most gemstones, including diamond, need enhancement through cutting or treatment to be enjoyed in jewelry. 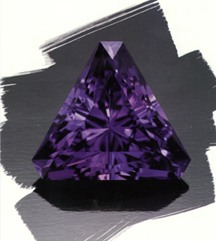 Tanzanite is heated to permanently draw out its exotic bluish-purple color. Care should be taken to protect Tanzanite from knocks, pressure and extreme temperature changes. Though wearable every day, remove Tanzanite jewelry before engaging in sports, housework and gardening. Avoid home ultrasonic cleaning. Tanzanite breaks new ground in establishing your own personal traditions, and its blue and purple hues are associated with generosity and friendship.